Create a beautiful accent with this single panel fireplace screen. 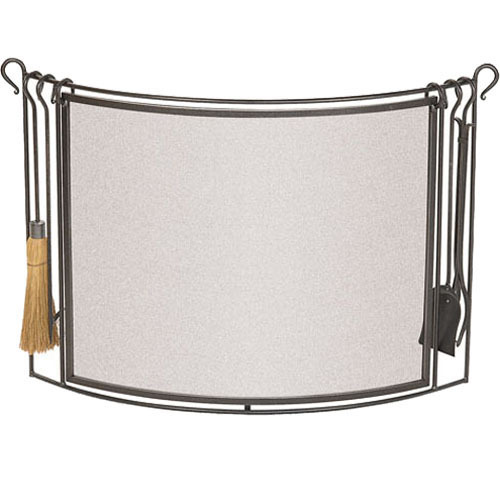 This bowed-shape fireplace screen includes a full set of matching hearth tools. The entire set features a vintage iron finish. The bow shape forms a natural conforming look to your fireplace and hearth. The make it easy to properly clean and maintain your fireplace. The hearth tool kit includes a hearth brush, a poker, a shovel, and a log holder. The dimensions are 48 in. W x 36 in. H x 6.5 in. D.
Is this approved for exterior use? This would not be suitable for outdoor use. How wide is this Vintage iron bowed fireplace screen with hearth tools without the tools? The manufacturer advises that the screen portion of this assembly measures 36 inches wide and 30 inches tall. Can I buy the tools without the screen? Unfortunately, no. Pilgrim only offers this item as a complete set with the tools and the screen at this time.